I’m no longer riding on the merry-go-round. The other day, my niece, wife, and two-year-old daughter went to the Dutchess County Fair. Nothing too out-of-the-ordinary. My little girl hoisted on some John Deere tractors. Petted her fill of bunnies and cows, pigs and goats. Danced to a clown jamboree band. Watched her papa helplessly try to climb rope ladders to try to fetch her a lame stuffed animal. And rode ride after ride after ride. She and I took our first carousel ride, and for the first time I did feel the swirling sentiment of that musical merry-go-round that has pervaded so much of our cultural metaphors and home movie nostalgia. Then with her mother she shuttled up into a plastic helicopter that popped up and down and around. Then with her cousin she climbed ropes and ladders and slid down big slides. Then with her papa she whipped around in some dizzying body-whipping barrel ride he at least will never repeat. In Neil Postman’s classic Amusing Ourselves to Death, he makes the case that every great civilization has a city that represents the pinnacle of what that civilization had to contribute. Classical Greece, for instance, had its Athens. The city that most epitomizes the essence of modern United States culture, he claims, is Las Vegas. With its adrenaline-inducing glitz and sequined whiz-bang and free-for-all and all-base-instincts-you-can-indulge deals, Las Vegas is the city that is most about entertainment. I’ve never been to lounge lizard land so I can levy no judgment from experience, but I do wonder if sometimes we do amuse ourselves not so much to death but to avoid life. I like a good head-rattling ride every once in a while. A day every once in a while (every few years?) of pinging and ponging from one fried-butter sensation after another. Every once in a while a mind-numbing episode of The Office. Any number of people, I suspect, feel their days operate at the whim of strangers and estranged ones and disgruntled employees pulling the levers that twist them or drop them or force them to shoot down a chute for little reason other than that’s what they signed up for when they took the job. And sure enough, the carousel and the ‘copters and ferris wheels and spinning barrels all halted. For a moment, a peculiar but welcomed stillness overcame the midway. And the four of us – my wife, niece, daughter and I – simply sat down, faced each other, and talked and played. That moment, I suspect, was the most amusing of all. What about you? 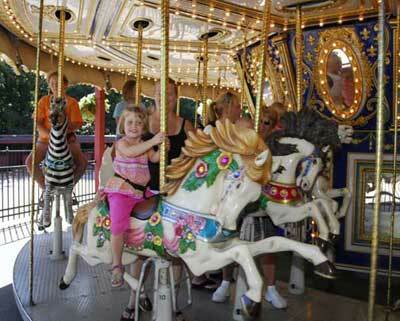 Which amusement park ride epitomized your day yesterday on Wednesday, 8.24.11? What were your day’s three highlights? Share them below – and let us know where you’re writing from. 1) Wrapped up a 75min full body massage by finding an active trigger point in my left hip. My masseuse was fascinated that the pain triggered up instead of down. I was fascinated by the flashback visions I had when she pressed it-the scent of my father’s shoulder. The first time I hugged my husband. Visiting my dying mom. Slides of those experiences played in sequence with each push of her thumbs. So that’s where I hid that pain..
2) Stepping into my yoga room just as one of my 12wk old kittens divebombed off the windowsill, unaware that the windowshade cord he had just successfully hunted was around his neck. Cuddling his warm purring body, glad he had no idea how bad that would have been for us both. 3)Be woken at 12am by warm familiar hands performing their nightly puja on me. The best reason to be woken from a sound sleep. 1. Drifting into waking dream state under the guidance of my acupuncturist-wife. 2. More munchy conversations with my niece in between eating & shopping in Woodstock. 3. After delivering a reading from two short stories in Saugerties, NY, a stranger stops me on the sidewalk and says, “I love Dorris!” – the name of a character in one of my short stories. 1. Having my first Skype call with my son who is at university- only an hour and a half away but how cool is Skype? Talking and seeing him makes it easier to chat about his week. 2. Catching up with two girlfiends for a casual meal that involved lots of laughter, talk, questions and care for each other. 3. Cooking gnudi for tea- delicious!